(Bloomberg) -- Zhang Qinghua’s debt-focused fund is trouncing almost every rival in China, benefiting from an early bet on riskier bonds that’s quickly paying off. Yet the E Fund Management Co. money manager has a problem: his favorite securities are hard to come by. Despite a flood of issuance in China since January, demand for convertible bonds is outstripping supply thousands of times over as more investors catch on to the new hot trade. Citic Bank Corp.’s deal in March had about 5,500 orders for every bond on offer. Bank of Communications Co. was said to cut its fundraising target by half this week. China’s debt investors are pining for a slice of the country’s nascent convertible-bond market, where they can find better returns in 2019 as risk-appetite makes a comeback. A gauge tracking the equity-like securities has surged 18 percent this quarter, on track for its best performance since 2014. That compares to a 3.4 percent gain for a broader fixed-income index, which includes government debt, policy-bank bonds and corporate credit. "The current problem is not oversupply, but the shortage of investment targets," said Zhang. "There’s vast demand for convertible bonds." Zhang’s $1.4 billion E Fund Stable Value Bond Fund has returned 13 percent this year, better than 98 percent of comparable Chinese funds tracked by Bloomberg. That’s because it’s taking on significant equity risk, though, whereas other fixed-income funds may not be. More than half of Zhang’s fund is invested in convertible and exchangeable bonds, according to its latest report, while about 11 percent is allocated to equities. The rest is mainly in other fixed-income products. E Fund Management raised three new funds focusing on convertible bonds in 2018 alone, Zhang said, without disclosing their size. Rising demand from investors could help drive growth in China’s convertible and exchangeable bond market, which has only 167 outstanding securities valued at about $62 billion, according to data compiled by Bloomberg. That compares with $4 trillion of corporate notes. Issuers have sold $17 billion of convertible debt in 2019, surpassing the value of stock debuts around six times over. "The market’s expansion is necessary to attract more money from investors like insurers, as well as those with an equities focus," said Zhang. 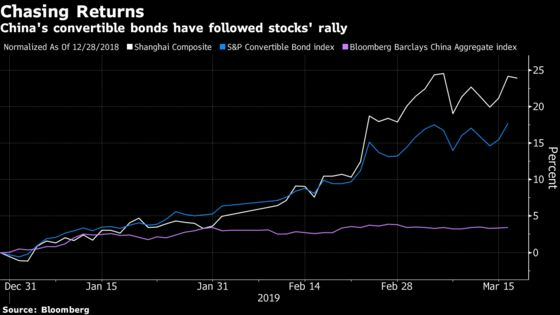 Just as the $1.9 trillion rally in Chinese stocks since January helped lift appetite for convertible bonds, concern that the equity market may be overheating is also spilling over. Investors typically bet on convertible bonds for potential gains on the equity conversion, meaning the markets tend to rise and fall in tandem. The Shanghai Composite Index is up 24 percent in 2019, beating all other national benchmarks. Despite the rally, Zhang is still bullish on convertible bonds this year and prefers them over other fixed-income securities. He says the yields on China’s corporate bonds are not attractive enough. “If stocks continue to rise, convertible bonds will follow suit," Zhang said. "The economy is likely to stabilize, so the drag on the stock market will decrease."